Without a doubt, ARMAGEDDON is the summer's biggest effects film. Although the actual number of effects shots doesn't come close to the quantity produced for LOST IN SPACE (which had some 750 digital composites, while ARMAGEDDON has around 350), the Michael Bay film contains some of the year's finest effects. The film's real star, the menacing asteroid headed to earth. Dream Quest built an enormous miniature asteroid, and covered it with digital particles to simulate gases emanating from the rock. To see a larger version of this image, click here. In the current climate of visual effects, where modern films continually test the boundaries of digitally created imagery, it is surprising and refreshing to see a film like ARMAGEDDON--a film that relies heavily on traditional visual effects techniques. Nearly every major effects sequence contained model miniatures; if not supporting the main action of the shot, then providing the focus of the shot. Visual effects supervisor Patrick McClung has outdone himself in his most incredible outing yet. With a rich history in modelmaking (with credits like GHOSTBUSTERS and DIE HARD), McClung supervised a trio of films for Digital Domain, each of which utilized miniatures to their fullest extent, in conjunction with computer generated imagery. For 1997's DANTE'S PEAK, which suffered through a terribly short post-production period, McClung put together one of the largest miniature shoots in motion picture history, giving the film a distinctive, organic look. Instead of relying of wholly digital means to create such things as pyroclastic clouds, trees, lava flows and raging rivers, the production created all of these elements with enormous miniatures. While ARMAGEDDON contains a great deal of computer generated imagery, it is remarkable how much miniature photography was used, and how well it holds up. The film opens with the depiction of the last great meteor to hit the earth, the hypothesized cause of the demise of the dinosaurs some 60 million years ago. As of late, opening titles and introductory scenes have become a wonderful opportunity for effects houses to flex their muscles, highlighted by such films as MEN IN BLACK (with its dragonfly animation by Autumn Light), CONTACT (Sony Imageworks' remarkable pullback) and ALIEN RESURRECTION (Duboi's haunting morphs of gruesome clones). The work by Blue Sky|VIFX for the opening shot ARMAGEDDON is brilliant. In a single shot, asteroids pummel the earth, creating huge fireballs that envelop the camera, wiping on the film's main title graphic. The camera swoops by the earth, revealing the massive destruction of the meteor shower, allowing the audience to fully examine the effect of this disaster. Geological inaccuracies aside, the shot is quite memorable. Explosion elements seem in scale, and the slow camera movement is quite bold--all in all, an exciting prelude for things to come. One of Digital Magic's composites of the New York destruction sequence. For a larger version of this image, click here. As calm and patient is the film's opening shot, the rest of the film is a fast-paced, in-your-face montage of action and destruction. Director Bay's history is of directing music videos and commercials, where ideas need to be quickly conveyed to the viewer, where patience is anorexic, and where cliche and stereotypes dominate. As he did with THE ROCK and BAD BOYS, Bay has carried this style to feature films, where his hyper-editing of action sequences, such as the meteor shower of New York City, leaves the audience wanting more. Bay's intent is to bring the audience into the action, attempting to draw us in by mirroring the violent action onscreen with violent, seemingly random camera movement and editing choices. While it worked at some level for THE ROCK, Bay has taken it to the extreme in ARMAGEDDON. Bay's style for directing and editing action was mimicked by the visual effects shots in ARMAGEDDON. This is quite a shame, since audiences are not able to fully enjoy the film's effects--instead, we are treated to 50 frame snippets of effects. Take for example the brilliant shot of the Chrysler building being severed in half, its top half soaring toward the ground (and the camera). Designed as a single shot, Bay cut it into two shots. Digital Magic's compositing of its New York meteor shower shots is excellent. Also contributing to the sequence was Cinesite and Digital Domain, with certain hero miniatures created by Hunter-Gratzner Industries. As an interesting aside, HGI was contracted to build and destroy the Chrysler Building for ARMAGEDDON, just weeks after being contracted to build and destroy the Chrysler Building for GODZILLA. In both films, their work shined. Another of Digital Magic's composites, a meteor blasts through one building, through yet another skyscraper, then lands on the roof of Grand Central Station. For a larger version of this image, click here. streaking across the sky, and computer generated elements and miniature elements seem locked into real-life photography of New York. The most dynamic of all the New York shots is of a meteor smashing through two buildings and landing on top of Grand Central Station, in a single shot, with the camera panning and tilting to capture the action. Digital Magic's compositing of miniature and computer generated elements make this shot quite memorable. Interiors of Grand Central Station being blown away feature some brilliant matte paintings and models, combined with film of panicking New Yorkers. Digital Domain handled these interior shots with their usual flair. The great, wide, helicopter shot of New York in ruins, with the World Trade Center smoldering in its ashes, is a remarkable epilogue to the action-packed sequence. The film's early sequence of a space shuttle being riddled with meteors and eventually exploding in a fiery blaze is largely uneventful, with the exception of the nice, distinctive camera shake added to some shots of tiny meteors slicing through the shuttle. The next big effects sequence occurs as the Freedom and Independence are launched, jetting our heroes into space to destroy the oncoming asteroid, a huge chunk of rock the size of Texas. Unlike APOLLO 13, which used actual photography of the real-life NASA locations sparingly, the ARMAGEDDON team generously used real-life launch photography as a basis for the effects sequences. In ARMAGEDDON, the Freedom and Independence have a slightly different design than NASA's space shuttles. Instead of creating shots from scratch, some shots used real-life launch photography as a basis, with miniature versions of the Freedom and Independence composited over the photography. One of Dream Quest's space shots, the shuttles Freedom and Independence zoom past the camera. For a larger version of this image, click here. The camera angles for ARMAGEDDON's evening launch sequence are not as remarkable as APOLLO 13's, which had a camera weaving through the launch tower, a camera underneath the rocket boosters, and cameras in other places doing moves that would be impossible during a real-life launch. Instead, ARMAGEDDON's shots are captured from real-life locations. The result is a amazingly realistic and convincing launch sequence. As the ships reach space, the shots become more cliche, and, at times, quite cheesy in style. While the compositing, lighting and execution of these shots is quite competent (mainly handled by an in-house team of effects artists, as well as Dream Quest Images), the design of many shots became repetitive and dizzying. How many times did we have to see the two ship zip past the camera, leaving only a few inches between the ship and the camera? Not only are these shot horribly unrealistic (in that if this were actually choreographed and photographed in space, no one would ever allow a spaceship to travel that closely to a camera rig), but seeing the same choreography repeated over and over becomes quite annoying. The brief sequence of Shanghai being destroyed contains some interesting effects shots. 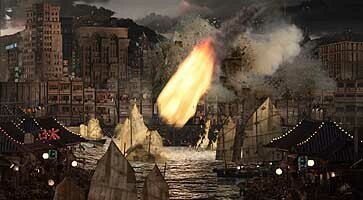 The initial shot of the asteroid smashing into the water is deep and contains a real sense of depth, created by a mixture of matte paintings, miniature buildings, and computer generated debris. However, the opening shot is severly impacted (no pun intended) by an obvious and annoying 2D camera 'tilt'. The two shuttles eventually arrive at the Mir space station, and the shots that depict their docking with the station are quite impressive. The subsequent destruction of the station, mainly realized through miniatures, was standard and adequate--however, the final shot of the shuttles zooming past the camera as the station blows up was a bit excessive. Brought in late in post-production, Digital Domain was tapped to handle the Shanghai destruction sequence, where an enormous asteroid strikes the town at night. The image above, created with a complicated mixture of 2D and 3D digital elements, as well as miniature and live-action footage, is the hero shot of the sequence, with the camera tilting down to follow the destructive path of the asteroid. There are plenty of amazing shots as the shuttles reach the giant asteroid, an eerie, dangerous rock with huge tendrils reaching into space. The design is quite brilliant, making the rock appear like something out of a gothic nightmare. The ships' descent to the surface is, at times, remarkable, with colorful emanations seething from the rock, surrounding the ships as they zoom toward their destination. The crash landing of the Freedom, realized almost entirely in miniature, is quite good, although the sequence goes on far too long. Yet another of Dream Quest's composites for ARMAGEDDON, a huge chunk of rock lands in the middle of Paris. For a larger version of this image, as well as the aftermath shot, click here. While our heroes attempt to destroy the rock, another huge meteor blasts Paris. In a wonderful one-two punch, the effects artists of ARMAGEDDON give us two very different views of Paris. First, Dream Quest Images produced the impact shot, as we see the rock hit the surface, causing a shockwave to rip through the city and eventually destroying the entire city. Although the pattern of earth rising from the ground is a bit out of scale, the shot is amazing. The composition of the shot is stunning, with the entire widescreen frame filled with energy. The aftermath shot is equally breathtaking--a helicopter shot of the city in ashes, provided by Matte World Digital. The asteroid action continues, as the asteroid itself is hit by a meteor shower, primarily executed by Tippett Studio. As is the case in many sequences in ARMAGEDDON, the sequence is enormously complex and was executed with flair. However, the repetition of these sequences dulls the senses. As meteor after meteor pummels the rock, shot after shot, impact after impact, it's clear that Bay is confused. Ironically, in his attempt to bring us into the action, he is actually losing our attention by repeating similar actions and motions over and over again. This hyper-direction of the visual effects is the biggest criticism of the effects, themselves. In nearly every sequence, the effects are brilliant--but leave us wanting more (or in the meteor shower sequence, less), due to Bay's incessant need to cut away to something different. What makes effects films like JURASSIC PARK and TITANIC so successful is their long, winding shots that allow the audience to fully examine the illusion--and then believe it as reality. ARMAGEDDON contains some of the most brilliant visual effects of the year. Unfortunately, it is surrounded by one of the most annoying films of recent memory. The film is a loud, obnoxious experience that runs far too long. Combined with this year's other turkey, GODZILLA, one thing becomes quite clear: effects artists are doing their jobs... why can't writers and directors?